Christopher G. Moore is, simply put, my favorite living essayist. 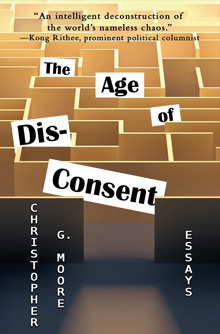 So I was pleased to learn his fourth book of essays, The Age of Dis-Consent is available in Ebook format. The paperback can be ordered at his web site www.cgmoore.com along with information on where to find it on Amazon, Kobo and Smashwords. The book of essays should be available at Thailand bookstores now and no later than February 8th, 2015. With endorsements from one of my newly discovered and favorite political analysts, Kong Rithdee whom most will know from his work at the Bangkok Post and Thitinan Pongsudhirak a professor at Chulalongkorn University and prominent political analyst in his own right, readers will find themselves choosing from an array of essays which combine Thai politics and societal issues. 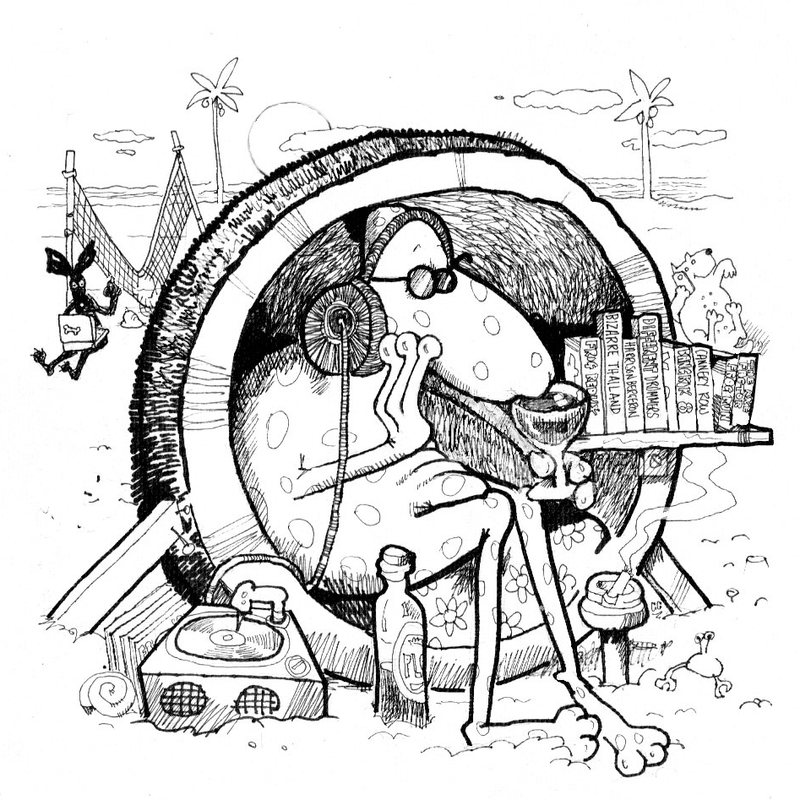 The topics affect every man and woman, regardless of where they might call home, while blending in literary elements, which I particularly enjoy about Moore’s writing style. Individual essays are devoted to George Orwell, Kafka and Henry Miller. This is the the fourth book of essays penned by Christopher G. Moore, also known for his Vincent Calvino crime series. The Age of Dis-Consent follows up on, The Cultural Detective, Faking it in Bangkok and Fear and Loathing in Bangkok. The title is well thought out. These are not agreeable times we live in and permissions have been taken away, not granted, worldwide, particularly in the country Christopher G. Moore has called home for decades, Thailand. Moore helps identify not only the known permissions taken away but the ones not thought of by everyone. If you are one of the happy idiots that my favorite poet, Jackson Browne writes about in his song, The Pretender then the The Age of Dis-Consent is not meant for you. If, on the other hand, you want to make a bit of sense out of a very foggy world, Moore shines an effective fog-light into the distance, which simultaneously helps the reader see the world better, while reflecting on the fog particles as well. The book is broken down, conveniently, into seven sections: Thailand in the Age of Dis-Consent; Thai Law Enforcement and Cultural Mindset; Evolution of Violence & the Borderless World; Crime Investigation in a Changing World; Space, Time, Technology and Cultural Gravity; Information and Theory of Mind and; On Writing and Authors. Two of my favorite essays in the book are, Personalized Swat Teams for the Filthy Rich, about the growing wealth inequalities in the world. You don’t have to read the 700 page book by Thomas Piketty, Capital in the 21st Century, read Moore’s 11 page essay and you’ll learn plenty. In Violence: The Next Big Leap, Moore writes of the great experiment of domestication, drone warfare, and how the inevitable technological blind spots may pave the way to where it all began. As Moore reminds us, it takes endurance to pay attention. There are many people out there beating a drum with no shortage of followers. Christopher G. Moore deciphers the beats of those drums as well as anyone and makes readers realize the tune is more complicated than mere vibrations. There are more than enough reasons to add The Age of Dis-Consent to your reading list and bookshelf. To steal a line from both Lucian and Christopher found in the final chapter, I had a lovely time reading it and readers who enjoy thought provoking essays will too. I am usually in Thailand at this time of year and pick up Christopher’s latest book of essays. This year making massive life changes and freeing up life this side of the fence and won’t be there until May. I won’t be able to wait until then so I will have to order on this occasion. It will add to the other 3 books of brilliant essays written over the last 4 years by Christopher G. Moore. There certainly is some incredible material and real food for thought in the essays. I always agree with your thoughts regarding Mr. Moore, Trevor. I look forward to seeing you when you get to Thailand. Take care of business on the other side of the pond. Thanks for taking the time to leave a comment. I’m getting it on Amazon! Does it make sense to you, Kevin, that I have to sign in to WordPress in order to “like” a post? I do like this one, but WordPress can go, um, do something to itself. Tim, I have, recently, had a number of complaints about the sign in process for WordPress. And comments are down as well. I do not have an answer, but fear greed may be involved. Seriously. It ain’t about our convenience. Thank you all the more for taking the time to leave a comment, given the inherent hassle created by WordPress. I know you will enjoy many if not each and every one of the essays by CGM.